Need help deciding which Dog Crate or Dog Bed size you need? You have come to the right place! When shopping for a dog crate, dog mat, or dog bed, deciding what size to choose can be a little confusing. Knowing the proper measuring techniques will help to ensure a proper fit for your dog. In most cases, customers tend to order larger than needed to make sure their dogs are comfortable. There are cases were space is limited so the minimum appropriate workable size is necessary. Measuring your dog for a crate - Measure Length of your dog from nose to tail. Measure Height of your dog from top of the head to the ground unless your dog’s ears naturally stay up then measure to the tip of the ears. Measuring your dog for a mat or bed - How your dog sleeps makes a difference. Does your dog sleep curled, stretched out on their side, or even stretched out on their backs? While your dog is in their normal sleeping position, measure the length of your dog from nose to tail and their width at widest point. You will want to add at least 4" to the length and width to ensure your dog has extra room. Crate/Bed size vs Dog size - It is important that your dog can turn around and stand up inside the crate or that the dog is not hanging off a mat or bed. To ensure proper fit (minimum appropriate sizing) use the following calculation. Can the dogs weight determine the right size crate or bed? - Perhaps, but the best way to shop for your pet is by using measurements and this is true with many pet products. 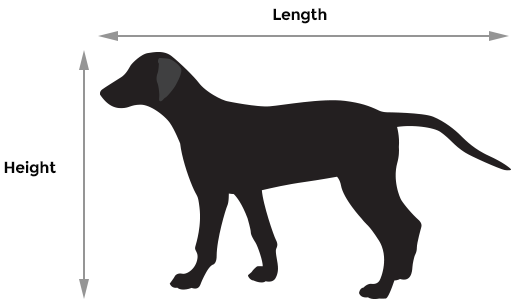 As an example, a Dachshund can be light in weight but their bodies are long so the charts using “dog weight” (see sample chart below) could be misleading. We always recommend ordering based on measurements first. 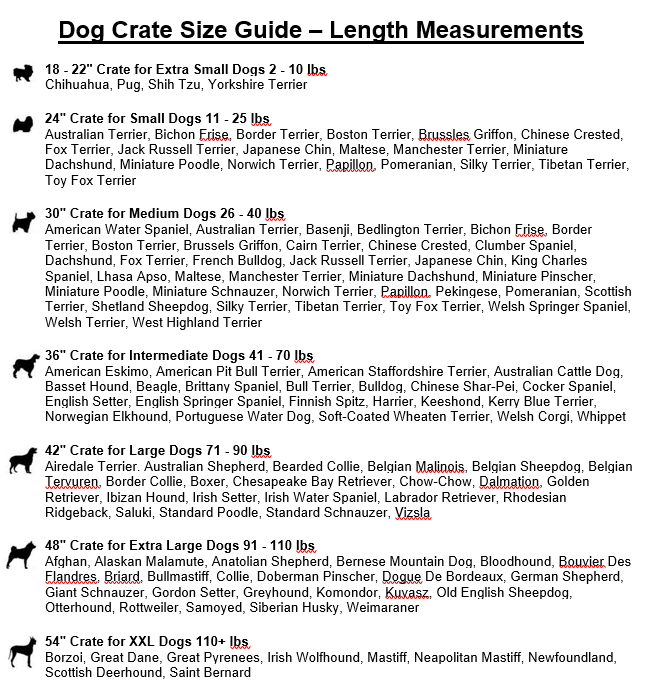 After you have your measurements and find the crate that will work best you can check the dog weight on the chart to see if they match up but if they don’t go with your measurements! NOTE: Measurements are the primary tool of measure. Some charts list dog weight as a guide but if a dog is overweight/underweight that would affect the size recommended. Using the measurements + weight is a good cross reference but measurements are key!